Are you a lover of the glossy kitchen design? If you fancy it in your own home, but aren’t sure if the look will work, today’s guest post has some top tips to consider. Enjoy! Kitchen adverts featuring the shiny, glossy, slick modern look spark envy in us all – and it’s a style many of us would love to have in our homes. It’s undeniably a bold design statement, so many are left wondering if their kitchen would suit a glossy look when contemplating a new design. Considering this look for your home? Here are 3 top tips to help you make your decision with confidence and ease. A good kitchen supplier will have plenty of experience in bringing that expensive-looking, modern chic to homes of all shapes, sizes and ages. The glossy look is undoubtedly striking and impressive, but in actual fact it is also incredibly versatile and looks incredible in any home, no matter what the style or age. Often, having such a sophisticated change in style in the home can really diversify the whole look of your house, as well as adding a completely new dimension to existing rooms. Having a blend of complimentary yet different styles can also add value to your home – so carefully choosing a knowledgeable and experienced company to help you to create your dream kitchen is key. Just because you have a small kitchen, doesn’t mean you can’t have the glossy look. In fact, this style often adds light and the illusion of space, as well as offering lots of clever storage solutions to create real space in the kitchen and reduce clutter. Don’t immediately assume your small kitchen won’t be able to carry the look off. ‘Show Home Chic’ puts lots of people off splashing out on their dream-style kitchen, because it simply doesn’t look – or feel – real. But in actual fact, these kitchens offer a lot more than style – and they are often even more practical than traditional-style kitchens which can be limited in terms of what fixtures and fittings can be installed and what will fit in with the overall look. These styles actually owe themselves to innovative storage solutions and intelligent features which can really enhance not only the look, but also the functionality of your kitchen. In some stylish kitchens, quality sadly can be superficial, and whilst they may look trendy and appear to offer the latest solutions, equipped with top of the range appliances, sometimes they only look good and don’t actually. With kitchens such as those offered by Trend Interiors, they are designed with you in mind, as they know that it’s vital that your kitchen is fully functional and a pleasure to cook in – that’s why any good kitchen supplier will specialise in the highest quality installations. Make sure you research your supplier and check the specifications of the products they sell. If possible, search for reviews and see what other customers have to say. 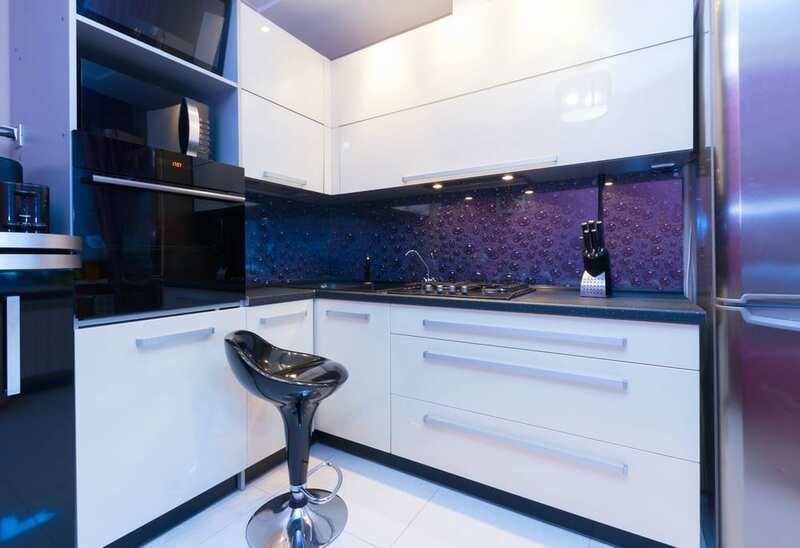 With Trend Interiors Kitchens, you can rest assured that you’re getting top quality designs and a great glossy look. I think that this style can be easily looking quite clinical and sterile. So I would work around it to introduce some personality into it. It’s great for minimalist contemporary kitchen style but perhaps a piece of art or unique worktop, splashback or rug would make the kitchen more unique. Personally I lived with white gloss contemporary handle-less kitchen in Zurich for a while and the cleaning especially around the dishwasher, bin door and sink were part of my daily evening routine. Every little finger print was so visible which drove me mad. I concluded it wasn’t for our family lifestyle. I do agree that reflective surfaces are great for small spaces though! Too much color for me. but the design, looks great.